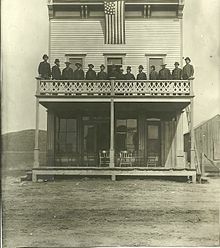 The founders of the town of Minnesela standing on the balcony of the Minnesela Hotel in 1889. This is an incomplete list of ghost towns in South Dakota, United States of America. Ghost towns can include sites in various states of disrepair and abandonment. Some sites no longer have any trace of civilization and have reverted to pasture land or empty fields. Other sites are unpopulated but still have standing buildings. The Volunteer Fire Department in Ardmore in 2010. Sign marking the location of Burdock in 2013. Addie Camp Pennington 1892-1917 Neglected Also known as Kennedyville, Canadaville, or Addie Spur. Alta Pennington 1870s-? Neglected Also known as Altamine. American City Lawrence Barren The exact location is unknown due to flooding that has destroyed all traces of the town. Anchor Lawrence This town was in the Ragged Top mining district. Not to be confused with Anchor City. Anchor City Lawrence This was an early mining camp close to Deadwood. Also called Anchor; not to be confused with Anchor. Annie Creek Lawrence Also called Stanley City or Reliance. Atlantic City Custer Barren The exact location of the town and its mine are a mystery. Balmoral Lawrence c. 1897-1910s Neglected Possibly an earlier name for Cyanide, which was in the same mining district. Bear Butte Lawrence Not to be confused with Bear Butte, the butte located to the southeast of the town site. It is also called Bare Butte. Bear Gulch Lawrence c. 1870s-? Not to be confused with the Bear Gulch (Elkhorn) settlement in Pennington County. Bear Gulch Pennington Barren (submerged) Submerged under Pactola Lake. This was a stop along the Black Hills & Western Railroad. Not to be confused with the Lawrence County settlement by the same name. It is also called Elkhorn. Bear Rock Custer An early placer mining camp. It housed the first post office in the Black Hills, which was only a cave where mail was delivered. Bernardsville Lawrence c. 1877-? Barren Exact location unknown, but is somewhere one-half mile east of the Wyoming state line. Besant Lawrence Neglected Also called Besant Flats or Besant Park. Bloomington Brown ?-1877 Barren Was destroyed by outlaws. Boulder Lawrence ?-1880s Barren Also called Boulder Park. Brashville Lawrence February 2, 1881-June 1882 The dates listed are the dates that the post office was in operation. Brennan Pennington Also called Warbonnet and Siding Eleven. Burdock Fall River Neglected Also called Argentine. Calcite Meade Barren Also called Quarry. Carbonate Lawrence c. 1881-1939 Neglected The town was mostly abandoned in 1891, but the town's last resident died in 1939. It was also called West Virginia, Virginia, Carbonate Camp, Carbonate City, and Crow Creek Carbonate Camp. Cartersville Lawrence Not to be confused with Carterville. Also called Lincoln. Carterville Pennington 1879-? Not to be confused with Cartersville. Also called Carter. Cascade Fall River 1888-? Abandoned Also called Cascade Springs. Castleton Pennington 1876-1880, 1890s Neglected The town was abandoned twice: first in 1880, when the mines failed; and again in the 1890s. Castleville 1877-1879 Barren The location of the town is unknown other than that it was located in or around the Black Hills. It could have also been located in Wyoming. Centennial City Lawrence Barren Existed around 1876. Centennial Park Lawrence Barren Had a population of 52 in 1900. Channing Lawrence Barren It was a very small town that was only shown on one map. It was about 3 miles northwest of Nemo. Cheyenne Falls Fall River Barren A very small community that never had a large population. It had a post office in 1900. Cold Springs Custer Abandoned This mining town once had a school and cemetery. Copper Camp Pennington c. 1900-? Cyanide Lawrence Neglected Was in the same mining district as Balmoral, Preston, and Dacy. Dacy Lawrence ?-c. 1915 Barren Was in the same mining district as Balmoral, Cyanide, and Preston. Dansby Custer ?-1886 Barren Had a maximum population of 50-75 people. Also named Danby. Deerfield Pennington Barren (submerged) Also called Mountain and Mountain City. The town site is underwater. Diamond City Lawrence Barren Existed around 1880. The surviving ruins of the town were torn down in 1967. The former site of East Sioux Falls in 2009. Elizabethtown Lawrence Later incorporated into Deadwood. Englewood Lawrence Also called Ten Mile Ranch. Etta Pennington Barren Also called Etta Camp. [[Eureka, South Dakota (Pennington Cis unknown. Not to be confused with Eureka in Pennington County. Evans Place Lawrence Barren Its exact location is unknown. Fair View Pennington Barren Existed around 1887. Flatiron Lawrence 1890s-? Neglected Not to be confused with the other Flatiron. It was a successful mining town from the 1890s until about the 1930s. Flatiron Lawrence c. 1921-? Barren Not to be confused with the Flatiron which was much bigger and existed long before this town. Flora Custer 1890s Barren Was a tin mining town. Its exact location is unknown. Floral Pennington Neglected Also called Florence. Not to be confused with Florence, South Dakota located in Codington County; or the similarly-named ghost town Flora. Folsom Custer Was a gold mining town. Forest City Submerged under Lake Oahe. Fountain City Lawrence Also called Mountain City. Was incorporated into Deadwood. Gayville Lawrence Also called Troy, it was an early placer mining camp that had a significant population, but was later absorbed into Deadwood. Not to be confused with the Gayville in Yankton County. Gibralter Meade 1877-? Barren Also spelled Gibraltar. Glendale Pennington 1880s-? Also called Otho. Golden Summit Pennington Also called Summit. Not to be confused with Summit, also located in Pennington County. Greenwood Lawrence 1885-1912 Barren Also called Laflin. The last house was torn down in 1971. Gregory Lawrence 1879-? Barren Also called Montana City. Not to be confused with the Gregory, South Dakota located in Gregory County; or the other Montana City in Lawrence County. Harney Pennington 1876-1900 Abandoned Not to be confused with the military encampment by the same name in Custer County. Hayward Pennington 11/1876-? Abandoned Also spelled Hayword. Hillhead Marshall 1915-1970s Neglected Also called Hilltop or Airmont. Hornblende Camp Pennington 1899-1915 Barren Also called Horneblende. Huseboe Corson Neglected Also called Lightcap. Hustleton Pennington Existed around January 1877. Storage building in Igloo, photographed in 2008. Igloo Fall River c. 1942-after 1970 Abandoned Also known as the Black Hills Ordnance Depot, it was a residential community located near a munitions storage and maintenance facility. Ivanhoe Custer Barren Not to be confused with Yamboya, which was also called Ivanhoe but was a separate community. Lakeview Todd Neglected Only the school and church are still in use by the farming community, but the actual town no longer exists. LeBeau Walworth Barren (submerged) It is submerged beneath Lake Oahe. Lily Day 1883-2017 Dissolved Dissolved in March 2017 by the Day County court due to its population reaching zero. Lithia Fall River Barren Most likely submerged beneath Angostura Lake. Lone Camp Lawrence Barren Was an early mining camp. The exact location is unknown, but it was around Maitland and Carbonate. Lookout Pennington c. 1884-c. 1890 Neglected The residential community of Fort Lookout. Aerial view of Manchester after the tornado outbreak that destroyed the town in 2003. Maitland Lawrence 1877-c. 1915 Neglected Also called Midland, Garden City, and Sherman. Manchester Kingsbury June 29, 1881-June 24, 2003 Barren The town was already in decline when it was completely destroyed during the 2003 South Dakota tornado outbreak. All that remains are the foundations of the buildings. Maurice Lawrence Now the site of the power plant for the Homestake Mine. Maverick Pennington Neglected Existed around 1891. Middle Boxelder Lawrence Barren This town's existence was proven by early photographs. However, its exact location is unknown. Minnelusa Pennington Barren Existed in 1920. Minnesela Butte 1882-1901 Barren The first county seat of Butte County, it was notable for its rivalry with the neighboring town of Belle Fourche in the 1890s. Montana City Lawrence 1879-? Not to be confused with Gregory, South Dakota, which was also called Montana City and was also located in Lawrence County. Montana City later became part of Deadwood. Moss City Custer Its exact location is unknown. It was most likely in eastern Custer County. It had a post office during the Black Hills Gold Rush days, but its population was never determined. Myers City Pennington Neglected Also called Myersville. Mystic Pennington Abandoned Also called Sitting Bull. Nasby Lawrence Barren Existed around 1910 as a booming logging camp. Nerve City Lawrence 1896 Located about 1,500 feet (460 m) north of Balmoral. New Chicago Lawrence c. 1875-1877 Barren Was a camp later absorbed into Maitland, South Dakota. North Galena Lawrence Barren The exact location is unknown, but it was probably somewhere around Galena. It was also called Carter City. Novak Lawrence Neglected Also called Cindell Spur. Nugget City Lawrence Barren Was in existence before or around 1898. Ochre City Pennington Barren Was a booming mining community around 1879. Oro Lawrence Also called North Lead. Otis Custer Barren The Custer State Game Lodge was built on the site of the town's mill. Pactola Pennington Barren (submerged) Submerged beneath Pactola Lake. Pine Grove Lawrence Barren The only indication of the site is that it was within twenty miles of Deadwood. Poorman's Gulch Lawrence Barren An early mining camp near Central City. Its exact location is unknown. Postville Meade Barren Was in existence around 1891. Potato Town Lawrence Barren Also called Potato Creek, after the town it was located on. Preston Lawrence c. 1897-? Neglected Was in the same area as Balmoral, Dacy, and Cyanide. Quartz City Lawrence 01/1878-? Barren Due to the inaccuracy of the maps drawn of the area, its exact location is unknown. Queen Bee Pennington 1880s-1930s Barren A large fire destroyed all remains of the town in the 1930s. Ragged Top Lawrence 1880s-c. 1915 Neglected Was also the name of the school district and mining district in which Preston, Cyanide, Dacy, and Balmoral were also included. Reausaw Lawrence Abandoned Also spelled Reavsaw. Redwater Butte Barren Existed around 1921. Reed Butte 1905-1910 Neglected Only the school house remains. Rockerville Pennington 1870s-1930s Abandoned The site has been rebuilt and is now a tourist attraction. Also called Rockville. Rosedale Pennington Existed around 1935. Rossville Pennington Was in existence around 1883. Runkel Meade c. 1900-? Barren The only real marker of the town is an apple orchard that still stands today. Also spelled Runkle. Sacora Meade Barren Existed around 1891. Safe Investment Lawrence Also called Spruce. Sheridan Pennington fall 1875-after 1930 Barren (submerged) Also called Golden City, it was submerged under Sheridan Lake. Silver City Lawrence An early mining town on Bald Mountain. Not to be confused with the Silver City in Pennington County, which is still active. Slabtown Lawrence The town only survived for two years. Its post office was later moved to Novak. Snoma Butte 1885-? Barren The town was once home to the Snoma Finnish Cemetery, an NRHP-listed place. It was probably intended to be called Suomi or Suoma. South Bend Lawrence It had a population of 116 in 1880, but when it was abandoned, the residents moved to Central City. Sparta City Lawrence 1878-? Barren Its exact location is unknown. Squaw Creek Lawrence Barren Its exact location is unknown. Stamford Jackson 1909-1934 Burned down 3 times before its closing. Texas Town Union Barren All that remains is a cemetery. It is also called Texas. Tigerville Pennington 1878-1885 Neglected Also called Tiger City. Travare Roberts Neglected Was the original county seat of Roberts County. Trojan Lawrence ?-1959 Neglected Also called Portland. Two-Bit Lawrence 1876-1900s Barren Also called Two Bit. Victoria Lawrence Not to be confused with the Pennington County location. Victoria Pennington Not to be confused with the Lawrence County location. Virginia City Lawrence Also called Virginia Moll. Not to be confused with Carbonate, which was alternatively called West Virginia or simply Virginia. Volunteer Meade Barren Existed in the early 1900s. Whitetail Lawrence Existed around 1900. Whitewood City Lawrence Barren Not to be confused with Whitewood, which is still an active community. Williamsburg Lawrence Barren The exact location is unknown. The town existed in the early days of the Black Hills Gold Rush. Yamboya Custer Barren Also called Ivanhoe. Not to be confused with the other settlement called Ivanhoe, which was also in Custer County but was a different town. Young Pennington Barren It was mentioned in a newspaper in fall 1879. ^ Lusk, Victoria. "History, memories bond as 130-year-old town dissolves". Farm Forum. Aberdeen News Co. Retrieved 19 September 2017. Engebretson, Pat; Heck, Kay; Herrett, Helen (1989). A History of Butte County, South Dakota. Dallas, TX: Curtis Media. ISBN 0-88107-139-0. Parker, Watson; Lambert, Hugh K. (1974). Black Hills Ghost Towns (1st ed.). Chicago, IL: The Swallow Press. ISBN 0-8040-0637-7. Wolle, Muriel Sibell (1966) . The Bonanza Trail: Ghost Towns and Mining Camps of the West (5th ed.). Bloomington, Indiana: Indiana University Press. "Ghost Towns in South Dakota". Ghost Towns. Retrieved September 28, 2013. This page was last edited on 18 February 2019, at 07:23 (UTC).